for as long as the feelings remain unchanged. To those who stand in harm's way for the freedoms we at home too often assume a birthright, and not the single greatest blessing one human can offer another, won at inconceivable cost, please accept one free man's humble, heartfelt, sincerest gratitude. A safe, peaceful and happy Thanksgiving to all. 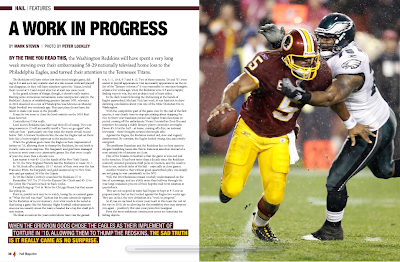 By the time you read this, the Washington Redskins will have spent a very long week stewing over their embarrassing 59-28 nationally televised home loss to the Philadelphia Eagles, and turned their attention to the Tennessee Titans. The Redskins will have either lost their third straight game, fallen to 4-6 and seen any realistic shot at a late-season wildcard playoff run disappear, or they will have somehow upset the Titans, leveled their record at 5-5 and stayed alive for at least one more week. In the grand scheme of things, though, it doesn’t really matter. Barring some miraculous turnaround, some unexpected catalyst, the Redskins’ chances of establishing genuine January NFL relevance in 2010 dissolved in a rain of Philadelphia touchdowns on Monday Night Football two weekends ago. They just plain do not have the talent to make real noise in the playoffs. It may be too soon to close the book entirely on the 2010 Redskins however. Lord knows Redskins fans have had their fill of losing. Two winning seasons in 12 will inexorably instill a “here we go again” vibe with any loss –particularly one that sinks the team’s overall record below .500. 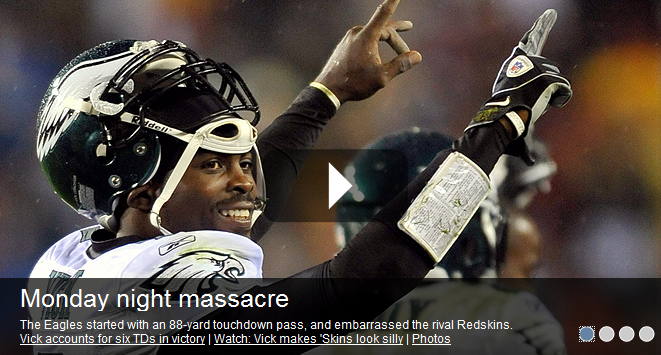 An historic beat down like the one the Eagles laid on them feels like a heavyweight’s uppercut to the midsection. When the gridiron gods chose the Philadelphia Eagles as their implement of torture in 2010, allowing them to lay 59-28 on the Redskins, the sad truth is it really came as no surprise. The burgundy and gold have managed to turn in avert-your-eyes catastrophe games like that every couple of years for over a decade now. Last season it was 45-12 at the hands of the New York Giants. In ’07, the New England Patriots laid the Redskins waste 52-7. In ‘05, fresh off a cathartic 52-17 victory of their own over the San Francisco 49ers, the burgundy and gold sauntered up to New York only and got sautéed 36-0 by the Giants. In ‘03 the Dallas Cowboys crunched the Redskins 27-0. Remember ‘01? Try 37-0 to the Kansas City Chiefs and 45-13 to the Green Bay Packers in back-to-back weeks. I would bring up 73-0 in ’40 to the Chicago Bears, but that would be piling on.